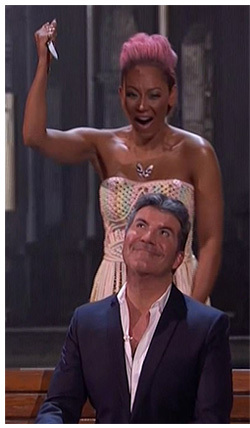 Mel B gleefully stabbed Simon Cowell live on TV last night – courtesy of Scottish mindreader Colin Cloud. But the trick demonstrated on quarter-final of America’s Got Talent was ensuring she used a rubber knife, rather than one of the real blades on offer. Cloud’s fate now lies in the hands of the viewing millions, with a phone vote deciding who makes the semis. But Mel B praised Cloud as ‘incredible’. Cloud – dubbed the ‘real life Sherlock Holmes’ – also successfully figured out what embarrassing moment one random audience member was thinking of. But for the main trick he guessed the name and occupation of another punter – chosen by Mel – then the reason she would like to kill Cowell. The woman then selected one of five knives. which was handed to the former Spice Girl as she stood behind Cowell. But when told to plunge it into the impresario’s chest, she found that it had a rubber blade. Cloud, who has just finished a run at the Edinburgh Fringe, is hoping to follow in the footsteps of fellow variety acts such as Tape Face and Piff The Magic Dragon who have found US success following their appearances on the NBC show. The current season of America’s Got Talent has been topping 13million viewers in the ratings. And already Cloud’s appearance on the show has attracted 500,000 views on YouTube.